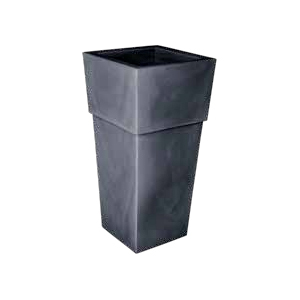 High Square flower Pot Collection "Aquila"
TEIPLAST is a new line of high quality flower pots. Shock-proof, light, strong against sudden changes of temperature and UV stabilized. These products are ideal for the furnishing of exterior and interior spaces in perfect harmony between design and functionality. Innovation and quality are always our core values. In order to meet optimally the needs of the international market, we use the best raw materials and the most advanced production technologies, including rotational molding, by which we created TEIPLAST, which allowed us to further expand product range provided, implementing the decorative solutions for indoor and outdoor furnishings. TEIPLAST represents a range of high quality, modern design and attractive, meeting the highest standards within the parameters of lightness, resistance to shock and extremes temperature. The best solution for decoration of interior and exterior spaces that require class, elegance and weather resistance. NPB contains a range of flower pots produced with selected raw materials, which allow a perfect seal even under bad weather conditions.